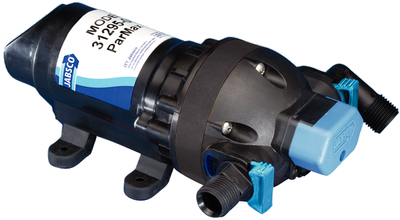 Smooth, quiet 3-chamber diaphragm pumps are self-priming up to 10' and can run without damage. Built-in bypass gives less pulsation and reduces the need for an accumulator tank. Can handle up to 3 fixtures. Corrosion resistant materials. CSA listed, meets ISO 8846 marine ignition protection. 1.9 GPM, 3.5 amps, 1/2" hose barb ports.